How can I Open/Stop Sales with Calendar? HOME > REVENUE AREA > How can I Open/Stop Sales with Calendar? STEP 1 : First you need to go to the REVENUE tab. 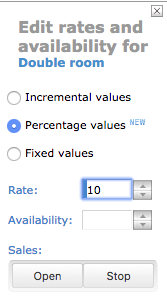 STEP 2 : You have different Calendar views available: MONTHLY / BY-MONTHLY / YEARLY. STEP 3 : Select the relevant room types under the ROOMS section on the left side and then the relevant dates, by clicking on the calendar or drag the mouse to select a wider period and then click on EDIT. STEP 4 : On your left hand side you now need to click on STOP and then REVIEW AND PUBLISH CHANGES. You will now receive a short summary of the changes you just did. In order to confirm & publish them, click on PUBLISH IT. After this you should get a calendar view with the blocked dates displayed now in red as shown below. 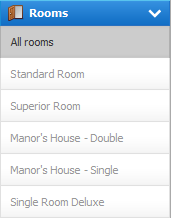 This can be done to ALL ROOMS at the same time, or for each individual room separately, according to your selections on the left sidebar. In order to Open/Stop Sales you can also use the new Tools options. For that, please check our e-commerce card here.